In the Netherlands people cycle for all kinds of every day purposes and I am no exception. So when I need to go to the dentist I get on my bike. On a wonderful winter’s day I thought it would be nice to let the camera roll while I went there, so you can virtually ride along with me. I still have my dentist in Utrecht, even though I haven’t lived there for almost 20 years. Because I also work in Utrecht I need less time off from work with my dentist in the same city. And I’ve been a patient in that same dentist’s practice from early childhood, that’s over 40 years, so why change? The Route to the dentist starting in the bottom of the picture going all the way to the top. Most of it is on protected cycle paths and the rest in 30km/h (18mph) zones. The arrow shows from where and into which direction the bird’s-eye view picture below was taken. The route is only 4 kilometres and it usually takes me between 10 and 15 minutes depending on traffic (lights) and wind force. With the camera in one hand and riding in a snow-covered city it took me a bit on the longer side, but I still stayed well under 15 minutes. 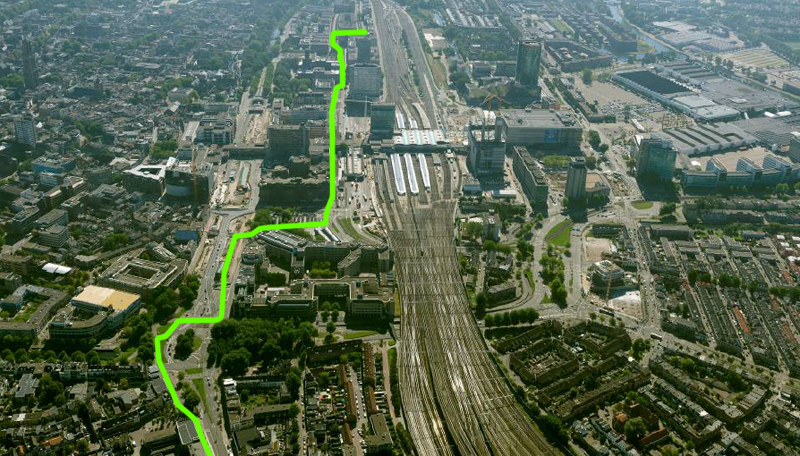 The first half of the route takes me through an area that is being reconstructed around Utrecht Central station. The ride starts at the top and the bottom of the picture is about the 6:30 minute mark in the video. I had to cycle right through the redevelopment around Utrecht Central station that has a lot of temporary detours for people cycling as I have shown you before. But the detours are pretty good and they don’t really slow you down much. The bird’s-eye view shows the first half of the ride. Starting from the top and working my way down in the picture. I reached the bottom of the picture at the 6:30 mark. That is exactly the start of the Napoleonic road to Amsterdam that I have shown you in one of my very first videos. The Amsterdamsestraatweg (paved road to Amsterdam) is now exactly 201 years old. But has been transformed into a normal city street rather than the main highway from Paris to Amsterdam that it was when it was finished in 1812. From that 6:30 mark it is a straight line with protected cycle tracks all the way to my dentist who resides in that street. Ride from my work to my dentist in Utrecht. Turn on annotations to see extra remarks about what you see in the video. You can see all the familiar features of Dutch cycling infrastructure. Keep in mind that this is ‘real route’ from my work to my dentist. There is no cherry picking going on here. But still all of the infra is well enough to cycle on even in winter conditions, even when the city is rebuilding its heart and even when not all of the ride is on separated cycle paths. Turn on annotations for extra remarks about what you can see during the ride. 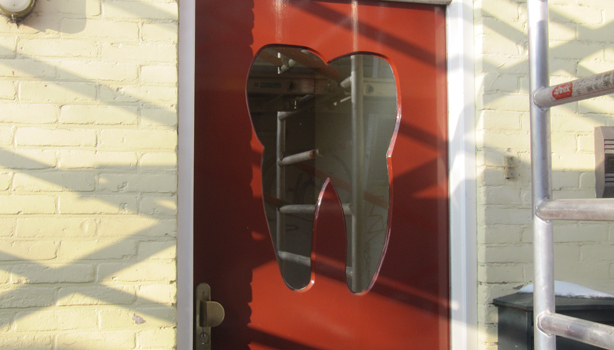 It is pretty obvious that I have reached my destination at the end of the video: this could only be the front door to a dentist! That door with the tooth on it could also be where the person who makes something called fugglers, which are these kind of creepy dolls with ultra realistic teeth. Google it, or actually you are better off not. Mark, at first I thought you must be mistaken or exaggerating (as people often do in Los Angeles when they talk about how much time it takes to get somewhere) when you wrote that this trip takes you 10-15 minutes riding on a bicycle. Then, I watched the video and discovered the secret. You only had to stop at a traffic signal or stop sign three times through the entire route. This parallels a dedicated busway that used to be a streetcar route (bike paths are only along riverways, railways and parks in LA) and its 16-ft wide (if you include the pedestrian walkway). Each traffic signal is activated by either a pedestrian push button (more than arms length away from the ramp to the street) or a bus moving through the intersection next to the bike path. I also came across references to your videos in a new book written by various academics entitled City Cycling. Chapter 6, written by Peter Furth, who is a professor of Civil and and Environmental Engineering, references two of your videos on page 122. It was also interesting to see a Dutch traffic engineers perspective on the city of Austin at 9 minutes into the first part of the presentation. He described the downtown area as a jail surrounded by walls due to the freeways that encompass it. His mention of having to stop many times while riding in his group was a irritant to him and his other Dutch participants. He described the bike riders in Austin as very brave having to travel without protection from fast moving motor vehicles. Yes, that is what I always try to explain: average speed is high when you don’t have to stop often, not because of your speed. It’s no use racing from red light to red light, your average speed is much higher if you leisurely ride from green light to green light. Thank you for your example. Is very different indeed. A nice track, but much more the feeling of riding on the side walk because the track ends just before every junction and you really have to cycle off and on the side walk at the lights. I had seen the references to my videos in the publication: I bought the book from donations to this site. Very surprising. I’ve met prof. Peter Furth personally when he came to the Netherlands and I gave a presentation to his summer school students, last July. I knew he used the videos for his students, but he didn’t tell me he had made those references in a publication. At around the 4:10 mark, are those OV Fiets bikes? Yes, I hadn’t seen them myself, at the 04:06 mark to the left next to the building the blue and yellow bikes are OV-fietsen. That must be a parking place for spare bikes, because you can get them in the building, 24 hours a day at this location. Thanks Paul, I think you may have recognised the entrance to the underground bicycle parking under the office where I work from your visit. The street where my dentist is located must be familiar too. It features in one of your own videos from your ride from Amsterdam to Utrecht. Nice video! I just started to blog (www.3pm.nu) and was thinking about using a video for a blog. How do you make those annotations? The annotations are made in YouTube after the video has been uploaded. They are simply overlays that can be turned on/off by the viewer as opposed to ‘rendered’ titles. They do an excellent job of clearing the snow! I’m taking my bike to the dentist tomorrow morning here in Northern California. It’s about 7 miles so it will take me longer than 15 minutes, but taking the train wouldn’t save me that much time anyway so I’ll ride the whole way. LOL, me too…and I also no longer live in the city from my childhood. 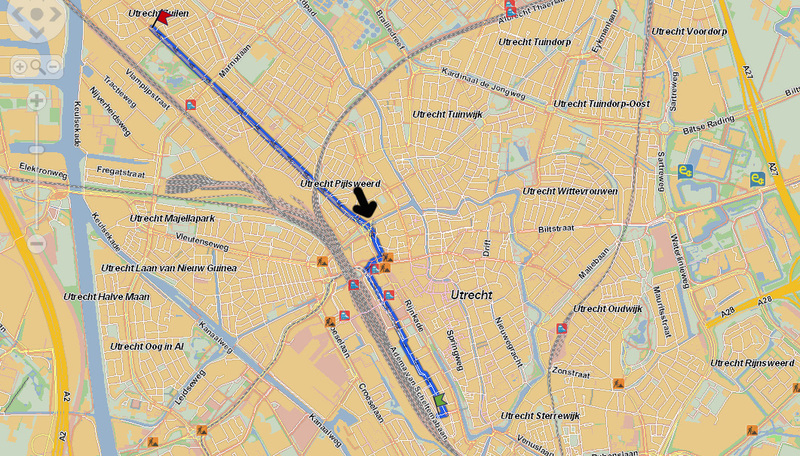 This entry was posted on 14 February 2013 by Bicycle Dutch in Original posts and tagged cycle paths, infrastructure, ride, snow, Utrecht, Winter.